The rat is charming, aggressive, and shrewd, while the tiger is sincere, generous, and influential. When a Rat and Tiger Chinese zodiac signs come together in a relationship their similarities may be too much. Like the rat, the tiger loves to be the center of attention in any social situation. A Chinese tiger animal sign can come across as being a very intense person at times, but truth be told; tigers are very sensitive and fragile. This combined with their strong romantic and playful side is actually good for the rat. They both tend to have high energy levels, which can be great, as they both need this quality in their partner. In the beginning Rat and Tiger love compatibility will be exciting and stimulating. It’s usually a little intense due to all the similarities in personality. These two Chinese astrology signs are also very family oriented and would do anything for those close to them. The rat and the tiger have strong tendencies to be emotionally distant, yet both are warm hearted and love deeply. If the nagging rat and moody tiger can find some common ground to stand on and keep from tiring of one another, they can make a strong, lasting couple. A big downfall for the rat and tigers relationship is the clashing characteristics. While the tiger may have the ability to get the rat to lighten up a bit and be a little less shrewd, the rats constant nagging and mocking can begin to wear on the tiger’s patience. The same can be said of the rat though when it comes to the tiger’s constant mood swings. The Chinese rat horoscope sign has some problems in the way of remaining faithful is there is no real excitement in the relationship. This should not be a as the tiger has tons of energy and can be very playful. The problem in the Rat Tiger Chinese zodiac compatibility is that they are both willing to fight to win the spotlight. The tiger has problems giving up and strives to win at everything. This can be an issue. Especially since the tiger also like to the head of their social group. If the tiger is a man and the rat a woman, they could either be excessively happy or it could be a complete catastrophe. The rat as a female tends to be overly domestic and a bit on the anxious side, while the tiger male doesn’t worry about small things and lives a little more carefree than the rat can be comfortable with. The rat and tiger match do make compatible business partners, as long as they can establish, from the beginning, which is the lead. In this relationship the tiger would be best suited to head this partnership. A tiger is naturally authoritative and honorable. The rat is best working behind the scenes, using their shrewdness for business and their social skills to wow clients. As business partners, a rat and tiger compatibility can be extremely successful. 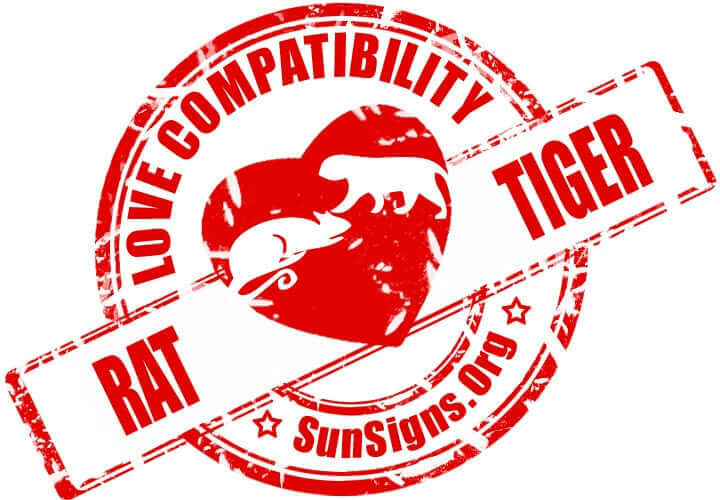 Rat & Tiger Chinese Horoscope Compatibility Rated 3 HEARTS!